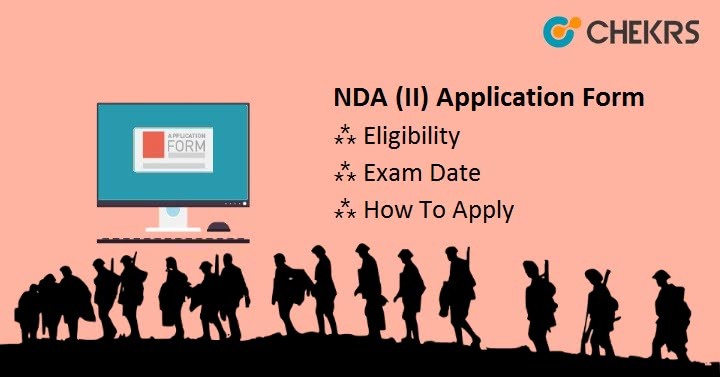 NDA 2 Application Form 2019: Union Public Service Commission (UPSC) conducts the NDA Exam twice in a year named ad NDA 1 and NDA 2. NDA is a National level Entrance Exam conducted to provide entry into Army, Air Force, and Navy. As you know these are the most reputed field. Latest Update: NDA 2 2019 Application form will be available from 7th August 2019. Latest Update: NDA 2 Exam Schedule Announced!! Check the table below. NDA is a reputed exam and candidates who want to serve the nation through joining the Countries Defense forces, eagerly waiting for it. So in this Article, we are providing every single detail about the NDA 2 Registration and procedure to Apply for it. In 2018 the Registration was started from 6th of June till the 2nd of July. For 2019 we expect the same date period for events of NDA 2 Application Form 2019. So we are providing the Tentative exam dates for NDA 2 2019. UPSC NDA 2 Eligibility Criteria will be released by official authority. Candidates need to check all the Eligibility Criteria before Applying Online. Indian, NRI, PIOs, OCIs candidates are Eligible for NDA 2019 Examination. Additionally, candidates who born in Nepal or Bhutan but living in India can also apply. Tibetan refugees who came before 1962 for permanently settling in India can Also Apply. Candidate should be of Age between 19 to 16 years. Candidates must passed 10+2 from any recognized central or state board. Candidates should be also physically & mentally fit as per the physical rules defined by the officials of NDA. In NDA 2 Application Form, you need to upload some document in specified size and format, and you can get all the details from the below table. Documents required Academic, Personal, Id Proof. The Complete Procedure can be divided into 2 parts, Do NDA 2 Registration and Fill the Application Form. It is the same on official website also, The Procedure is divided into Part 1 and Part 2. The complete Procedure is Listed Below. Follow it Step by step to eliminate the mistakes. First of all, Visit the UPSC Official Website i.e. upsc.gov.in. Now Find and Click on “Online application for various examinations of UPSC”. Now on the right side, you can see “UPSC NDA 2 Registration Form” with 2 links namely “PART-I Registration” and “PART-II Registration”. We will complete both parts one-by-one. Now, Read all the instructions carefully and then click on “Yes”. A new form will appear and you need to fill it up. Fill the form carefully with the correct information personal, academic, contact details etc. After Filling the NDA 2 Registration Form and rechecking it, Click on “Continue” button. On the next page, Click on “Update” button to update the filled form if required. Now, here you will receive Registration no. Note it Down, Because you will need it along with your DOB in the further process. You can also click on “Print Application Part-I” to download the filled form. Now again Reach the step 3 and this time Click on “Click here for Part-II Registration”. A login form will appear, Enter the NDA 2 Registration Number, date of birth and solve the captcha and then click on “Submit” button. You will be redirected to the Payment page, Pay the Relevant fee ( Rs. 100/- except SC/ST & Sons/ Daughters of JCOs, NCOs & ORs Candidates) using the available and proffered mode of Payment. After Successful Payment Click on “Continue” button. It will redirect you to a new form, Where you need to fill your Choices of Exam Center as per your convenience. You also need to upload the scanned images in the specified format. After Successful Upload click on “Continue” button. Download the filled NDA 2 Application using “Print Application” Option. That’s it, Congratulation You have successfully filled the NDA Application Form. You will get a notification after final submission on registered mobile no and mail. We also want to congratulation you again on successfully clearing the exam and also the interview. So Make sure to give us the chance also.Also Check our separate Article for NDA Syllabus and NDA Previous Year Question Papers. Best of Luck for the exam and keep Visiting !!! Good Luck, Keep visiting Chekrs. Hi Sanu! There is no Official Notification for NDA 2 2019 Available till now, So just Wait for it. As per expectation, the Age criteria is given above. Take a look at that. Thank You and Keep Visiting. Hello Shubham Satwik! Have you Filled NDA 1 2019 Application Form? because you were eligible for that one. For NDA II, those who have born between 2nd January 2001 to 1st July 2004 can only apply, So Maybe you are not eligible for the NDA 2. But still, wait for the final Notification. Thank You and Keep Visiting. Hello Mayank. We already Mention the Age Details in the Eligibility Criteria. Please Take a look and Verify your Eligibility…. Thank you Keep Visiting.